A funny little fact that you might not know about me is that I was a traveling wedding hairdresser for 12 years before I started this blog. I love wedding hair and it was my favorite to work on behind the chair. So today I’m sharing my professional hair tips with you on wearing the always stunning, “half-up, half-down” style for your wedding day! I’m going to jump out on a limb and say that the half-up wedding hair style is the most popular style worn by brides, hands down. The look is soft and romantic with a sense of youth. If you never wear your hair up, but are looking to keep your locks out of your face – this is the style for you! No matter if you have long, medium or short hair, this style will work – ok, pixie cuts are the exception. There are endless options and combinations of ways that you can weave your curly, wavy or straight tresses into a halfway up style. From a few simple pins back to multiple layers of braiding or twisting; you can wear it right at your occipital ridge or all the way down at the nape of your neck. The half-up base creates the perfect foundation for lovely hair jewels, combs, and veils – making it easy to accessorize. If you have thin hair and want the long/full look, your stylist can make it work with the addition of a few of the clip-in type extensions for extra volume and length. For this romantic style to look it’s best – you need dimension in your hair color! If your hair color has a very solid, one-color look, the detail won’t show up as well as it would with highlights for example. If you like your solid color, just have your stylist put a few baby highlights maybe a shade or two lighter than your original color, across your crown or just around your face – so that they will peak through and give you that sun-kissed look while adding a brightness to your design. 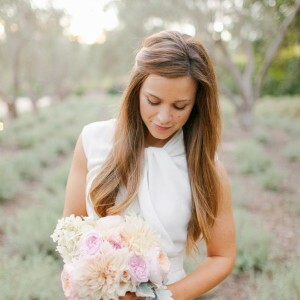 When looking for the perfect half-up wedding hairstyle, my best advice is to search for styles within your hair color! ie. if you have blonde hair, search “blonde half-up hair” or “blonde half-up wedding”. This will give you a much better idea of how it will actually look in your hair. Save multiple images to show your stylist to fully convey what you are looking for. Although I like to think of myself as the DIY wedding queen — as an ex-hair professional, I do not recommend DIY wedding hairstyles (unless you are a professional!). Styling your own hair for your engagement party, bridal shower and bachelorette party on the other hand is totally acceptable and these half-up looks would be perfect! Dirty hair is a must. One or two days dirty will give you a better foundation for your style. Start with dry shampoo, it adds volume, removes grease and will give you more texture. Curl or wave your hair first and use a working spray on each strand as you go. If you want to get really crazy, you can even pin each curl so it can cool before you let it down, which makes your curls last SO much longer. If you want to accentuate certain strands use a dry wax to piece them out. Once you are happy with your design, finish with a firm hold hairspray. Try not to move too much or touch your hair before portraits are complete; every single turn of your head will make the curls that are down loose their shape and get frizzy. It’s always good to do slight touch ups after your ceremony so that your style remains fresh for the rest of the night. 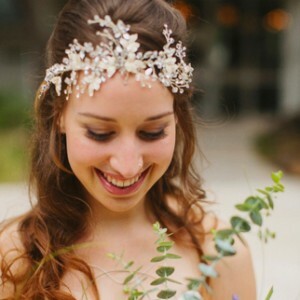 Abby from Twist Me Pretty has one that I’m obsessed with; perfect for a bridal shower. Once Wed has one for a really low, messy style that’s gorgeous. This post on Brit + Co. has a picture of pinning your curls like I was talking about! I know the images above are all of long hair, but short hair looks absolutely adorable in this style! 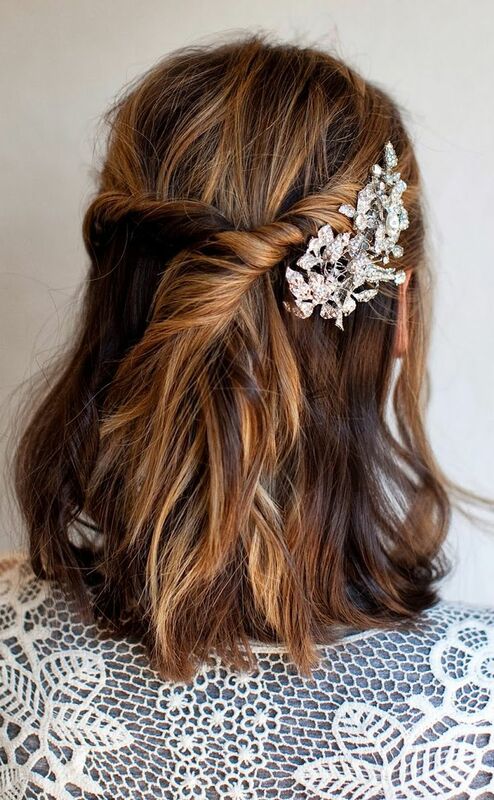 If you have a specific wedding hair style that you want Jen to discuss, please leave it here in the comments and maybe you’ll see it next month! !